This week the theme is BUTTERFLY in The Three Muses. 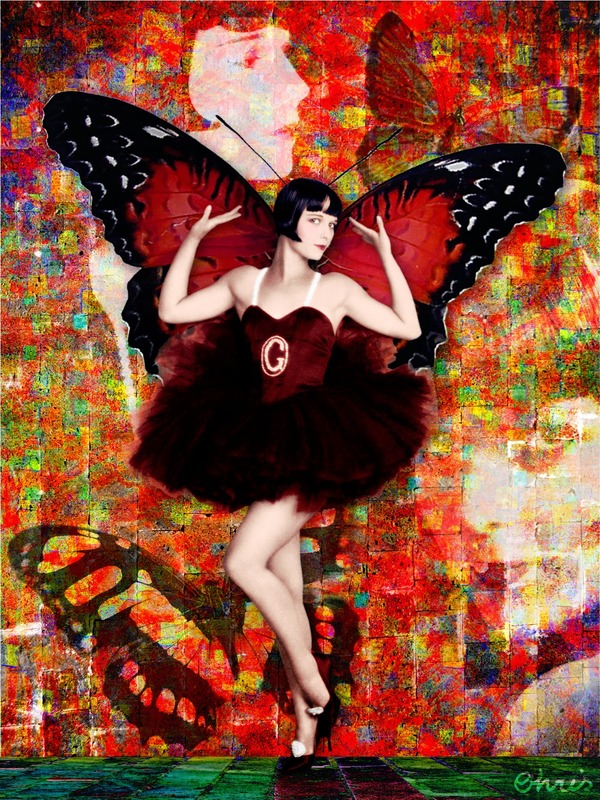 I went for a dramatic butterfly impersonated by Louise Brooks. Background is my own, made of two of my photos and a lot of editing; floor: Tumblefish Studio; Louise Brooks photos: Dr. Macro (the one on forground was colored by me); texture: Kim Klassen. Note: the "G" on her costume is for Griselle or Grisette, her characters in the movie Now We're in the Air (1927). I do so love the way her wings match her tutu, Chris. This is a beautiful piece. Applause from my corner! Love your dramatic take on the theme, Christine! She poses like a model;) Great piece, Christine. Wow, what a joyful and dramatic splash of colour, Chris, and the quote (I've never heard it before) IS PERFECT. Take a bow. Fabulous my friend I adore all that wonderful red...Marvelous work! I love the red color in that fabolous peace, exspecially the background you made. Sorry I nearly missed this one, Chris! It's superb in every way. Take a bow. this is gorgeous!!! love, love, love! So full of whimsey and your background is stellar! !